Just Another Day...: Big Day!!! Today has been a very big day in our household. 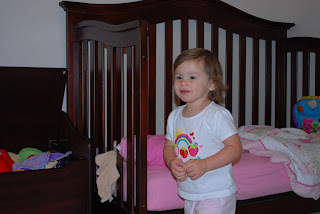 For starters, LO slept in her "big girl bed" for the very first time last night! She was absolutely amazing. She played with a little toy piano for about 5 minutes, then quiet. We checked in on her before we went to bed and she was out cold in her crib, snuggled nicely under her blanket. We were SHOCKED! She did wake up around 3AM crying, and hubs went in to check on her. She was standing by the door (closed, of course) like she wasn't sure what to do next. Hubs helped her back into her bed, handed her teddy and a paci, and she was out in no time. 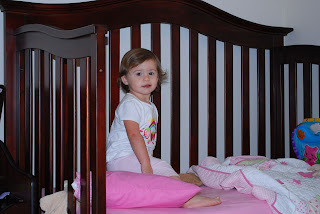 The pic above was taken as she watched daddy carry the front rail of her bed away. She said, "Oh, cooool!" 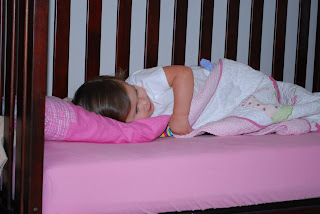 This is her "fake sleeping" in her new big girl bed! She was SOOOO excited!!! 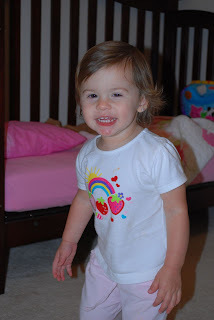 Here she is striking a pose for mommy! We celebrated her major milestone accomplishment with breakfast at Cracker Barrel -- usually one of mommy's favorites but very disappointing this morning. I've been feeling nauseous since we ate and haven't been able to eat anything other than a few crackers this afternoon. ((sigh)) I guess I need to remember that I am pregnant, with a BOY, who happens to be my husband's offspring. If you knew what I know about my husband's childhood, you'd know we've got our work cut out for us once TO arrives. So speaking of TO... I think we've found "the one." 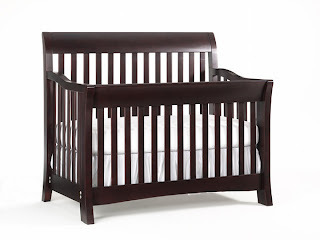 You know, the perfect furniture to outfit our son's bedroom (still SO weird to type that!). We had narrowed it down to two options: Munire Majestic or Bonavita Metro. While I haven't seen the Metro collection in person yet (we're going this afternoon to check out the floor model), I'm leaning heavily towards that option. It's just such a clean and contemporary design and I really am in love with it! Doesn't it look just gorgeous converted into a full-size bed? I think any teenage boy would be grateful to have such a luxury! 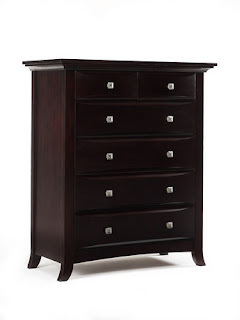 There's a pretty good chance we'll be ordering TO's furniture this afternoon, which is a GOOD THING because they say it takes anywhere from 10 to 12 weeks to arrive! Cute! MG has a twin bed & STILL has side rails. She's a crazy sleeper! She's been known to fall out with the rails up! You didn't ask, but I love the 2nd one!